Two days later and my upper lip is still the swollen byproduct of an overly aggressive display of affection from my Valentine. 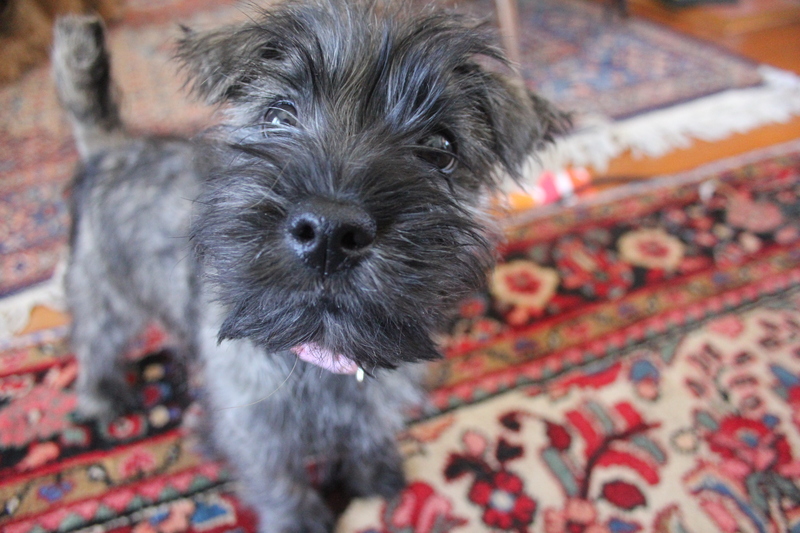 Rough-housing on the floor with a 3 month old terrier puppy is always risky business, no matter how small the tyke. Don’t let those miniature milk teeth fool you — they pack a mean pinch. how could you say no to that face? And then came the love bite and my swollen upper lip. 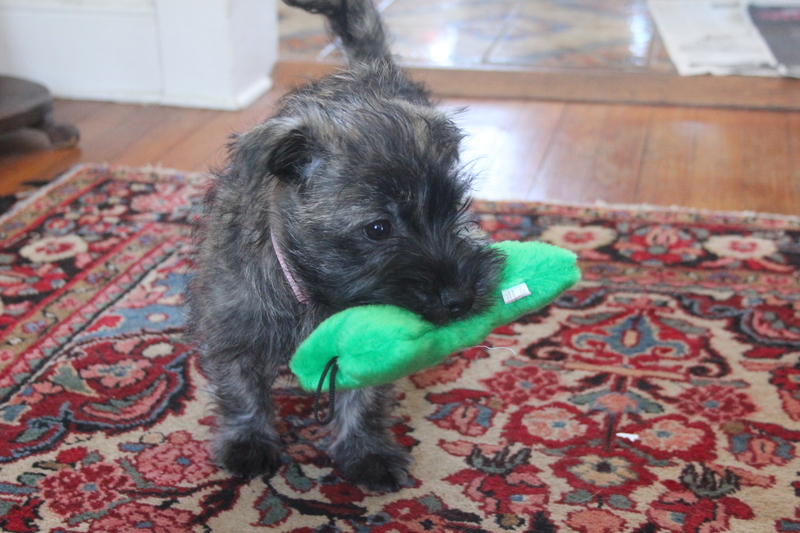 Wrap a red bow around its neck and call it Cupid, my new cairn terrier puppy Casey was my accidental Valentine this year. Accidental, because we almost didn’t pick her, but she wasn’t going to let us go home without her. 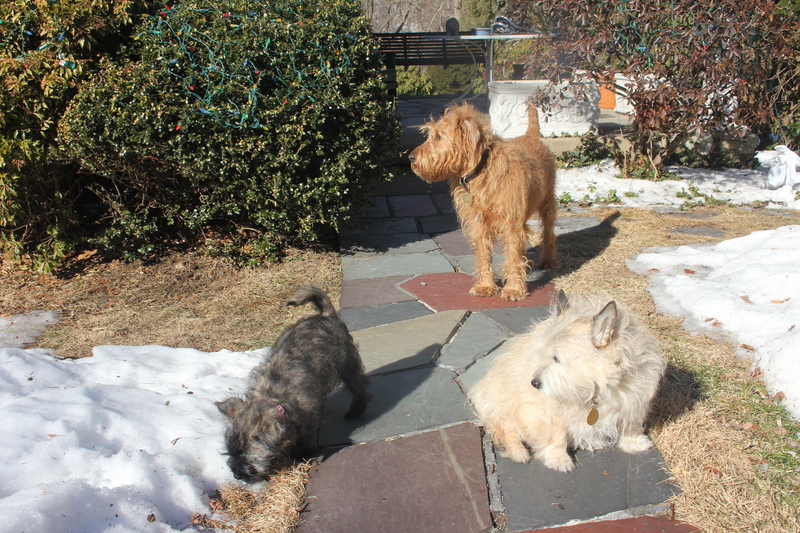 Last April, we lost Jessie, our 12-year old, brighter than a sunbeam cairn terrier. Since then, there’s been a gaping hole in the family. But to be honest, while we desperately wanted another dog in Jessie’s likeness, we weren’t fully committed to the endeavor of finding one. Jessie was survived by 2 other terriers, and we felt we owed them both more attention. Plus, puppies are huge emotional and physical commitments. Sure, I’ve cooked dinner for hungry boyfriends, but doing so wasn’t a mandated responsibility in the relationship. Puppies have to be fed. They also have to be picked up after, disciplined and loved (maybe they’re not so different from my exes after all). The analogy to children is apt, except that when it comes to puppies, we get to pick what breed, what gender and what disposition enters the family. Our standards were high. A dog that swallows earrings might develop other bad habits? Casey wasn’t our first choice. When we visited her litter 4 weeks ago, we came away wanting her sister. Casey’s ears drooped and her blueish, mottled coat made her look more warthog than terrier. Her sister was lighter in color with ears like tea-saucers — we saw her and saw our lost Jessie. But Casey had other ideas. On our second visit, Casey came to bat. My mother reached into the pen to examine the pup. Casey looked at my mum, looked at her tournmaline earrings, which matched her pink collar, and dove. Before my mother could ask for assistance, Casey had swallowed the 2 carat stud. Was it a sign? We were doubtful. It took her a day and a half for my mother to have a complete pair of earring again. On Valentine’s Day, we got a phone call to tell us the puppy was ready and that Casey was our only option. We didn’t think we were going to proceed — a puppy that eats gem stones may develop other bad habits. The hour and a half car ride was spent comparing the pup with the pink collar to the one with the white. By the time we got there, we were on the fence. Casey wasn’t. As I walked into the puppy room, she practically leap over the coral gate and into my arms. I caved and the little pup with the pink collar came home with me. Cupid’s arrow hit me hard this February 14th, just when I was least expecting it. But then again, that’s what they say about love, puppy or otherwise.